The Barton swing aqueduct on the Manchester Ship Canal is not only the World's first swing aqueduct, it is also World's only such aqueduct. Built in 1894 it is considered as an engineering marvel for that time. The aqueduct located near Barton upon Irwell, Greater Manchester, carries the Bridgewater Canal over Manchester Ship Canal. 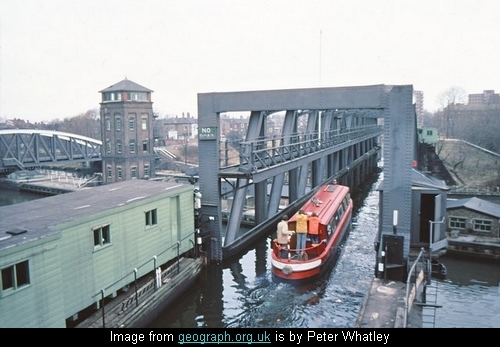 Unlike other aqueducts, it swings open to allow movement of large ships in the Manchester Canal. In closed potion it allows passage of smaller boats plying in the Bridgewater Canal to cross the Manchester Canal below it. This is second aqueduct at the location. The first one built 1761 was a conventional masonry aqueduct with fixed spans. The old aqueduct carried the Bridgewater Canal over River Irwell. 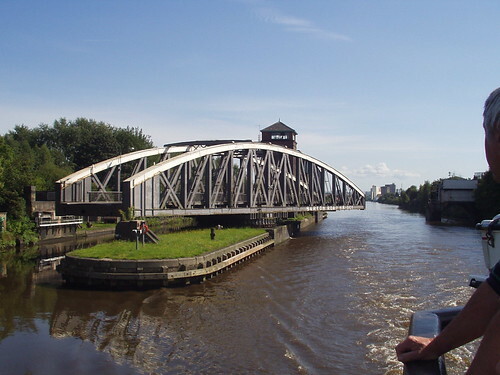 Later with the construction of Manchester Ship Canal running parallel to the river, the height of old aqueduct was found to be inadequate for passage of larger ships in the Manchester Ship Canal. It was therefore replaced in 1894 by the present swing aqueduct and is in use even today. The swing aqueduct consists of iron trough supported in a steel girders frame, which is mounted on a centre pivot allowing it to be rotated by 90 degrees. The moving portion of the aqueduct is 71.6m (235 ft.) long and 7.3m (24 ft) wide. The trough which sits inside the frame is 5.5m (18 ft) wide and 2.1m (6.9 ft) deep. Both the fixed portion as well as the moving portion of the aqueduct have rubber wedge gates on each end to retain the water in the canal as well as in the trough. Total weight of the swing aqueduct is 1,450-tonne which includes about 800 tonnes of water. 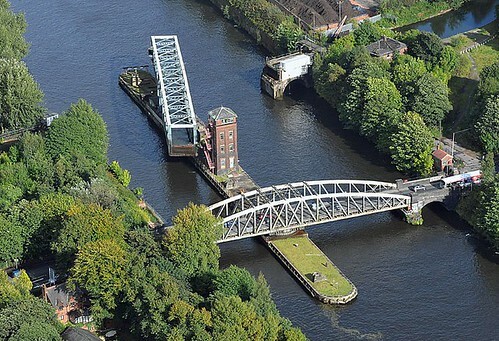 The swing mechanism rests on a purpose built island in the middle of the Manchester Ship Canal. As per Wikipedia "the turning mechanism built into the central island consists of a 27-foot (8.2 m) race plate embedded in granite blocks. Sixty-four tapered cast iron rollers sit on top of the race plate, held in position by a spider ring. On top of that an upper race plate supports the aqueduct and its circular gear rack, which was powered by a hydraulic engine." The hydraulic engine was initially powered by two steam boilers located on one of the bank of the Manchester Canal. Later the the hydraulic force was obtained using electric pumps. The control room for controlling the opening/closing of the aqueduct and movement of the ships is located in a 4 storied tower in the middle of the island. Nearby swing bridge for road traffic is also controlled from this tower. 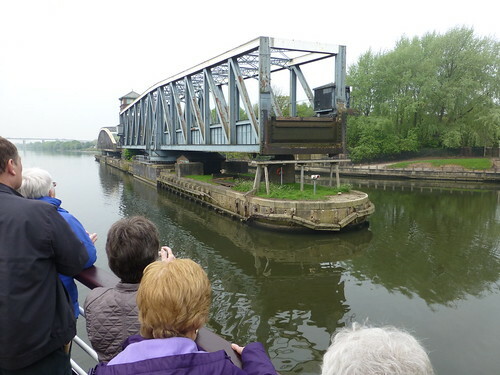 Following picture shows the swing aqueduct (left) and swing bridge (right) in fully closed position. Aqueduct in fully open position allowing the ship to pass through. The aqueduct in closed position allowing the boat to cross over the Manchester Canal. Originally it had a towpath along its length about 2.7 m (9 feet) above the water level but it was subsequently removed. An explanatory video of the swing action.